On Sunday, October 13th, we will be hosting a Youth Program at the USCA Sieger Show. Youths interested in attending should submit their intent to attend by Monday September 23rd, 2019. If you have a youth sport book, don’t forget to bring it with you! To submit your intent to attend email Elena Ortiz Please include your T-shirt size and contact information. 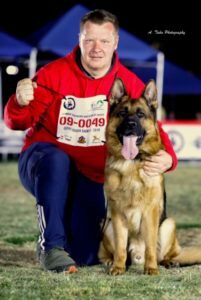 USCA Youth Program was founded to promote the dog sport of Schutzhund among our youth, through integrating the sport of dog training, competition, and encouraging the use of critical thinking skills, and teaching sportsmanship. Numerous segments of the sport are incorporated in our program for the handler to receive points for successfully handling dogs in any of these working dog arenas: Tracking, Obedience, Working Trials, Conformation Shows, Breed Surveys, volunteering at sanctioned events, Search and Rescue. Sportsmanship, one of the most important virtues to teach our children, and is regarded as a component of morality, fair play and good character. Our programs intent is to incorporate education and sport initiatives. To provide seminars and competitions. To encourage experimentation, foster leadership and camaraderie. To recognize and reward youth who demonstrate responsibility and dedication to academics and the sport of Schutzhund. Our Mission Statement: Promote the dog sport of Schutzhund amongst the youth of the United States of America. To provide educational opportunities about the sport, highlight the accomplishments of our youth by rewarding those who have excelled in the dog sport, demonstrated good sportsmanship, academic and civic responsibility. The Schutzhund USA Youth Scholarship is intended to be recognition in the form of an educational grant to those well-rounded student scholars. The Schutzhund USA Youth Scholarship Committee believes that it is very important for students to recognize their own potential early in their academic careers, and encourage them to foster its growth. America’s youth are not represented in the dog sport, if we do not promote this dog sport in the United States, it may not grow to have the bright future we have intended. Presented by the Youth Committee; the award is bestowed for academic achievements, grades 1 – 12.